Pope from 590 to 604; born about 540; died 604. Descended from an old Roman senatorial family, he had held various high official positions when he suddenly retired to one of the cloisters which he had founded. Sent as ambassador to Constantinople by Pelagius II., on his return became an abbot, and soon afterward, when Pelagius died from the plague, he was elected pope. He materially strengthened the authority of the papal see both by his personal influence and by his adroit policy; and in many respects he determined the standards of the Catholic Church for the following centuries. Gregory had a deep-seated aversion to Judaism, which to him was Jewish superstition ("superstitio"), depravity ("perditio"), and faithlessness ("perfidia"). He discarded the literal interpretation of the Bible which prevailed among the Jews, and designated their attacks upon Christianity as idle prattle. He forbade the literal observance of the Sabbath law, wide-spread among the Christians, on the ground that it was Jewish; and his deepest grievance against the Nestorians was that they were like the Jews. He extolled the Visigothic king Reccared for his severe measures against the Jews and for his firmness against their attempts at bribery. Gregory was very zealous in his efforts to convert the Jews, and tried to influence them by promising a partial repeal of taxes and by offering other material support to converts. He was very emphatic against enforced baptism, however, preferring conversions brought about by gentleness and kindness. He protected the rights of the Jews, and assured to them the unhindered celebration of their feasts and the undisturbed possession of their synagogues. On the other hand, he repeatedly opposed the possession by Jews of Christian slaves. Christian slaves and those who wished to accept Christianity were to be taken away from their Jewish masters. Indeed, he earnestly begged the Frankish kings to issue a decree forbidding Jews to hold Christian slaves. He was obliged, however, to mitigate the strictness of some of his measures. 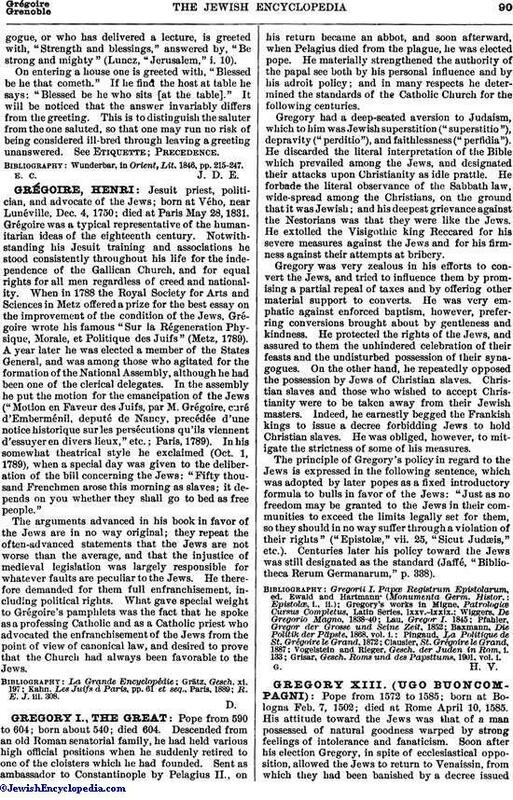 The principle of Gregory's policy in regard to the Jews is expressed in the following sentence, which was adopted by later popes as a fixed introductory formula to bulls in favor of the Jews: "Just as no freedom may be granted to the Jews in their communities to exceed the limits legally set for them, so they should in no way suffer through a violation of their rights" ("Epistolæ," vii. 25, "Sicut Judæis," etc.). Centuries later his policy toward the Jews was still designated as the standard (Jaffé, "Bibliotheca Rerum Germanarum," p. 338). Grisar, Gesch. Roms und des Papsttums, 1901, vol. i.